Maayo nalang kay nakastorya nako ang akong ig-agaw, nalipay nga naguol ko. Nalipay kay gisalbar sila sa Ginoo, naguol kay na-damage ilang puy-anan. The Baclayon Church in Bohol was also damaged by the magnitude 7.2 earthquake. A portion of the Dauis Church in Bohol was also damaged by the earthquake earlier today. Photo by YouScooper Michelle Francisco. Cebu, Philippines: A powerful earthquake killed at least 73 people on Tuesday as it tore down modern buildings, destroyed historic churches and triggered terrified stampedes across popular tourist islands in the Philippines. Fifteen of the confirmed fatalities were in Cebu, the countryâ€™s second most important city and a gateway to some of its most beautiful beaches, the national disaster agency reported. The 7.1-magnitude quake killed another 57 people in the neighbouring island of Bohol, famed for its rolling â€œChocolate Hillsâ€, while one other person died on nearby Siquijor, which attracts tourists with its pristine white sands. oh, no. kadaghan ba diay na sa fatalities sa bohol. CEBU, Philippines - The death toll from a 7.2-magnitude earthquake that struck the central Philippine island of Bohol on Tuesday rose to 93, as rescuers struggled to reach patients in a collapsed hospital. Centuries-old stone churches crumbled and wide areas were without power. Bohol police chief Dennis Agustin said 77 of the deaths came from the province. At least 15 others died in nearby Cebu province and another on Siquijor Island. The quake struck at 8:12 a.m. and was centred about 33 kilometres (20 miles) below Carmen city, where many small buildings collapsed. Many roads and bridges were reported damaged, making rescue operations difficult. But historic churches dating from the Spanish colonial period suffered the most. 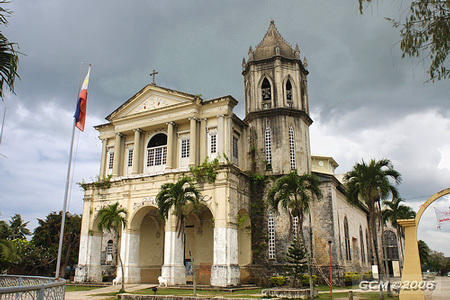 Among them was the country's oldest, the 16th-century Basilica of the Holy Child in Cebu, which lost its bell tower. Nearly half of a 17th-century limestone church in Loboc town, southwest of Carmen, was reduced to rubble. The highest number of dead â€” 18 â€” were in the municipality of Loon, 42 kilometres (26 miles) west of Carmen, where an unknown number of patients were trapped inside the Congressman Castillo Memorial Hospital, which partially collapsed. Rescuers were working to reach them, said civil defence spokesman Maj. Reynaldo Balido. As night fell, the entire province was in the dark after the quake cut power supplies. Windy weather and rain also forced back a military rescue helicopter. Authorities were setting up tents for those displaced by the quake, while others who lost their homes moved in with their relatives, Bohol Gov. Edgardo Chatto said. Extensive damage also hit densely populated Cebu city, across a narrow strait from Bohol, causing deaths when a building in the port and the roof of a market area collapsed. The quake set off two stampedes in nearby cities. When it struck, people gathered in a gym in Cebu rushed outside in a panic, crushing five people to death and injuring eight others, said Neil Sanchez, provincial disaster management officer. "We ran out of the building, and outside, we hugged trees because the tremors were so strong," said Vilma Yorong, a provincial government employee in Bohol. "When the shaking stopped, I ran to the street and there I saw several injured people. Some were saying their church has collapsed," she told The Associated Press by phone. As fear set in, Yorong and the others ran up a mountain, afraid a tsunami would follow the quake. "Minutes after the earthquake, people were pushing each other to go up the hill," she said. But the quake was centred inland and did not cause a tsunami. Offices and schools were closed for a national holiday â€” the Muslim festival of Eid al-Adha â€” which may have saved lives. The earthquake also was deeper below the surface than a 6.9-magnitude temblor last year in waters near Negros Island, also in the central Philippines, that killed nearly 100 people. Aledel Cuizon said the quake that caught her in her bedroom sounded like "a huge truck that was approaching and the rumbling sound grew louder as it got closer." She and her neighbours ran outside, where she saw concrete electric poles "swaying like coconut trees." It lasted 15-20 seconds, she said. Cebu city's hospitals quickly moved patients into the streets, basketball courts and parks. Cebu province, about 570 kilometres (350 miles) south of Manila, has a population of more than 2.6 million people. Cebu is the second largest city after Manila. Nearby Bohol has 1.2 million people and is popular among foreigners because of its beach and island resorts and famed Chocolate Hills. President Benigno Aquino III said he would travel to Bohol and Cebu on Wednesday. Thanks God! I just contacted relatives in tagbilaran. Everyone is okay, just there were some damage to some antiques, pero, everyone is fine and safe. Thanks Lord!! Dili gyud ma imagine ang kakusog sa linog ganiha. Naa ko sa Tagbilaran karon. Dili inanay nga linog bulhot jud iyang kakusog. Naa ko sa second floor sa among balay kay nag get ready ko maligo gikan nag exercise unya kalit lang ing brown out. Mag ukab pa diay unta ko adto sa akong computer ug sa kalit lang ing uyog ug kusog ang balay abi nako ug naunsa. Then I realize naglinog na diay. I scream sa akong mga bata nga Run.. run downstair ang get out here. Dagan mi kutob sa among ginhawa. Akong tulo ka anak tua tanan sa second floor pasalamat gyud ko nga nakagawas mi. So far walay damage among balay sa tagbilaran pero daghan kaayo ug after shock. Naa mi karon sa kalsada nang higda kay mahadlok mi mobalik sulod. Tanan tawo sa tagbilaran naa sa kalsada nang higda. Hi Raquel, i was also able to talk to my aunt who is based in Tagbilaran. They , too, are sleeping outside for fear of aftershock. I'm glad to know that you and your kids are alright, and safe. Take care over there, okay? God Bless you guys! glad you and your kids are fine, raqz. our prayers for your continuing safety. i have no contact with my sister in tagbilaran. her daughter said the same. she has been at the emergency room of the public hospital so extraordinarily busy tending to patients, she really doesn't know how her parents are. but something in me tells me they're fine. SALVE REGINA, MADRE DI MISERICORDIA. Kumusta na imong Nanay Te? The death toll in the powerful earthquake in central Philippines has reached 144, a government agency said Wednesday afternoon. Of the dead, 134 were from Bohol, nine from Cebu and one from Siquijor, Xinhua quoted Rey Balido, operational officer and spokesman of the National Disaster Risk Reduction and Management Council, as saying. Another 291 people were injured and 23 others were still missing. Over three million people were affected in the provinces of Bohol, Cebu and Siquijor. By Wednesday, 67 percent power was restored in Bohol, Balido said. The quake occurred at 8.12 a.m. Tuesday with the epicentre at a depth of 33 kilometers. Philippines President Benigno Aquino III flew to Cebu province early Wednesday afternoon to assess the damage caused by the 7.2 magnitude earthquake. He made an aerial inspection of the affected areas and distributed relief material to the victims.